While researching Echuca’s football history, one name repeatedly comes up, as one of the town’s greatest footballers and that is George Ogilvie. Taking a step back, there were actually two George Colin Oglive’s, father and son, both were great crashing followers with interesting stories, and like many footballing stories, (Hird, Barassi, Buntons) the story is much better understood in multiple generations. When I started reading about George he was just another hyped footballer. But reading the contemporary records shows George as a determined player and one who left a memory for those who watched him. One of these was South Melbourne Premiership Captain Jack Bisset. In 1934 Jack Bisset was captain of South Melbourne Football Club, the reigning VFL premiership team. His team included stars such as Laurie Nash and Bob Pratt. Bisset had played with or against a range of stars from the era from the Colliers and Coventry’s to Haydn Bunton, Ivor Warne-Smith, Allan Hopkins, Stan Judkins among others. Now standing in front of a group of young men he nominated his best player ever seen...... as ‘George Ogilvie’. “Bunton is one of the best, but he is below the standard of Ogilvie”. The crowd were not partisan Port Melbourne Supporters expecting one of their own to be nominated, instead they were a young men’s team. Jack Bissett had played with George Ogilvie when they were both at Port Melbourne around 1923-24 and it seems Ogilvie’s impression was long lasting even after Jack’s years in the VFL. The George Ogilvie Trophy is awarded to the winning captain in Echuca versus Rochester games. Further reading showed that in the 1947, the ‘Record’, a local Port Melbourne Newspaper, created a popularity contest for readers to vote each week. This best and fairest trophy was named the “George Ogilvie Trophy”. Ogilvie played only 42 games with Port and the club had a raft or champions and captains that the award could have been named after. Again this demonstrates the impact that George Ogilvie had. George’s story is a lively one and when finished, Jack Bissets words may make more sense. Like Bob Skilton Senior and Ron Barassi Senior, George Ogilvie's father shared the same name, and was also a brilliant footballer in his own right. In the late 19th and early 20th century Bendigo still had strong mining connections and the football was hard and tough. Like many places the late 1890's football was chaos. In 1895 the Bendigo Association had five clubs all local around the town. By 1907 only two of these teams (Eaglehawk and South Bendigo) would survive, and of the four newcomers within that time, none would survive past 1913. In 1898 North Bendigo failed to start the season, in 1901 Sandhurst started the season but dissolved mid season, after a number of disputes Eaglehawk left the competition in 1904 to try and build a rival league based in their township (didn't work and they were back in 1905). But chaos reigned in 1906 when the Association imploded due the enforcement of suspensions. Reigning premiers South Bendigo and newcomers California Gully formed their own competition, the Bendigo and Northern District Association, bringing in other junior teams, while the remaining three teams in the old League collapsed. The Bendigo club, one of the 1882 foundation clubs dissolved, while the others barely played a game and West Bendigo dissolved midway through the 1907 season. Of the new clubs the gold mining township of Long Gully was the most successful, winning the breakaway premiership in 1906 and then winning the reconstituted Bendigo Association Premiership in 1907. It would not be until after the First World War when a reconstituted Sandhurst club and the entry of regional clubs such as Rochester (1923), Echuca (1924) and Castlemaine (1925) brought stability and strength to the League. George’s football career reflects this chaos. He played for South Bendigo in 1895 before moving to Bendigo in the late 1890’s, transferring back to South Bendigo in 1899. After Eaglehawk’s era, South Bendigo, with George in the team, were a huge force over the next years winning the clubs first premiership in 1899 and then backing it up winning again in 1900,1902, 1904, 1905. 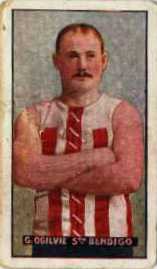 George played for the club in four of those premiership years, missing 1902 when he spent a year acting as an umpire. Privately, as a hotelkeeper in Long Gully he became insolvent in 1903 due to pressure from creditors, not uncommon in those days, and other documents show he worked as a miner. In 1905 Standard cigarettes produced a series of football cards featuring the Ballarat and Bendigo Leagues. George was one of the eight Bendigo League players to get the nod, now immortalising him for card collectors everywhere. Others to get cards included Fred Jinks from Eaglehawk (later Carlton, North Melbourne and Port Melbourne) and Joe Canavan from South Bendigo (Previously South Melbourne and later Melbourne). Jinks moved to California Gully in the breakaway league in 1906, but by mid year had started playing in Melbourne and soon made a name for himself at Carlton, . At this time the Bendigo League, like many country leagues played on the Wednesday half holiday, allowing dedicated footballers to play in both city and country at the same time. In early 1909, there was a personal catastrophe as the family home burned down after an accident with a candle.7 The family lost their home and most of their possessions. Rather than rebuild in Bendigo the Oglivie’s made the decision to move to Melbourne, into the working class suburb of Yarraville. Already a veteran of 14 years of hard football, George was soon playing with the reigning VFA premiers Footscray where he played for four years. George was a key follower in the Footscray team and immediately successful. In 1910 after turmoil within Carlton, Fred Jinks, once a rival in the Bendigo League, was now a rival in the VFA, playing with North Melbourne and later at Port Melbourne. In 1911 George represented the VFA in both of the Victoria v South Australia games where he was one of the best Victorians on the ground in each game.12 13 14 The second game resulted in a victory for Victoria. In 1912 he missed the VFA grand final, which would have probably been his last game, with an injury, as Footscray went down to Essendon. Before the start of the 1913 season, he retired from VFA football15, but supported his local club and in 1913 coached Yarraville. Yarraville, playing in the second tier Victorian Junior Football Association, had been premiers or minor premiers for seven of the eight previous seasons and under Georges coaching were again runners up. In 1914 George retired from Football and in 1915 he enlisted in the Army..16 George's WW1 Personal file oddly lists him as 49 years old (in 1915), 10 years older than his actual age, and that he served three months in Egypt in 1915-16 before returning to Australia without a comment in his file. George Senior died in Footscray in 1948, aged 72. In 1917, George Junior signed up, he listed his father as next of kin, living at 64 Ballarat Street, Yarraville, maybe half a dozen doors down from Margaret Berlowitz’s Pub. Margaret was Yarraville Football club’s president from 1914-1921 and the pub was a regular meeting point for the local club. It would have been a surprise if George, as an ex coach did not keep in contact. George grew up with a famous footballing father, first in Bendigo and then in Footscray/Yarraville. His father would have been recognised in the street. This must have had an impression on young George. To date, I can find no record of this, but the story certainly fits. George was to become a great footballer and from mid 1918 he was in 1st Division. George obviously made an impression and Richmond, captained by Dan Minogue, brought Ogilvie into their team in the VFL finals. 21 year old George Oglive played two games for Richmond in 1920 including the Semi final loss against Carlton as his second game. In practice games at the start of the 1921 season Ogilive tried out with Melbourne.23 and played for Melbourne in the Seconds (then called the Junior League) 24 George appealed the Permit Committee ruling but without success25. In June, he transferred to his father's team Footscray, then still in the VFA. Importantly this transfer was without a permit from the League.26 This meant that George could not play for any team associated with the League, such as Echuca. 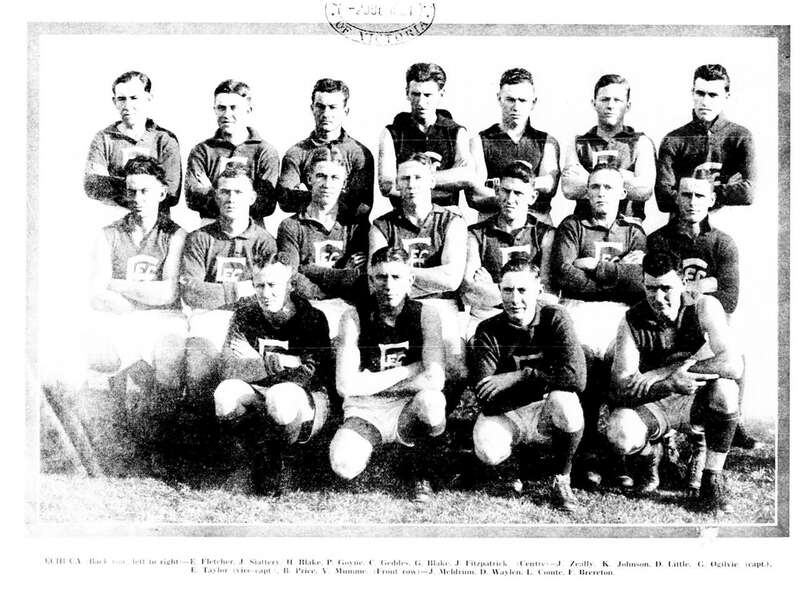 1922 saw Ogilive transfer to Port Melbourne29 where his team again made the final. 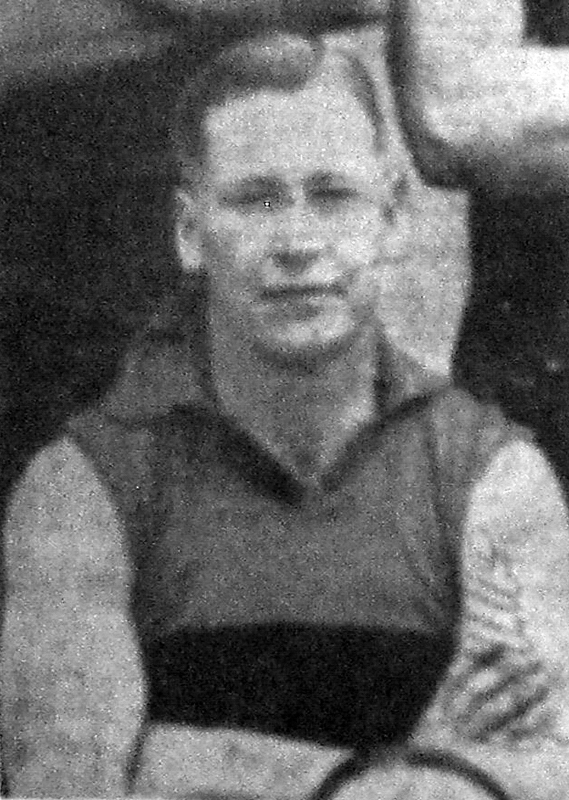 Ogilive played 44 games for Port between 1922 and 1924. In an extraordinary series of events, just before the 1922 Final, Ogilive said that he received an offer to return to Footscray next season including money for wages and expenses. He reported this to the club, taking this to be a bribe. Soon three other players also reported attempted bribes ( Bill Rudd, Gus Dobrigh, and Bill Walton). Then during the grand final itself, Ogilive reported that he was offered twenty pounds to stop playing. Port won the match, holding on for a two point win, but the bribery scandal marred to memory of the game.30 31 32 In the case of Ogilive’s accusations, because the attempt on the field was not overheard by anyone else, the case was dropped for lack of evidence. In the case of the other players, Vern Banbury an ex-Footscray player (and Footscray Hall of Fame Member) was found guilty and banned for life, but allegations against current officials and players were found not guilty. In Richard Jones biography on the footyalmanac website, he notes that George "won the Sporting Globe Medal as the VFA’s leading player in 1922-23-24. "41 Not a bad accolade. The decision was not popular in Echuca and a petition with 2000 names was conveyed to the League but again to no avail.43 On the bright side for Echuca the same meeting saw North Melbourne player Les Kew Ming’s application to transfer to Echuca be accepted. Kew Ming would be a key part of the Echuca team in the coming years. Echuca won their first BdFL Premiership in 1928 defeating Castlemaine by two points in the Grand Final. It was a great year for the town as they also won the country week cricket (where George also was a member of the team). George was a key part of the Echuca team. George created a huge shock, when after waiting so long to return to football, he took up the role of Captain/Coach at Yarraville in 1929 but George had spent a number of years at Yarraville in his younger days, and his father had once had the same role. Yarraville ended 1928 in 6th position on the ladder, and under George the team was in the top four with George often nominated as one of the teams best players.50 But internal conflict saw George resign in late June. At that stage Yarraville had 8 wins form 11 games. Yarraville ended the season in 7th position with 11 wins from 22 games. George played for Echuca in the second half of the season and was again suspended, this time in a dust up in the final game of the season, against South Bendigo. By 1931 George was captain coach. Echuca's players split up to find new homes, and George was elected Captain/Coach of neighbours and arch rivals Rochester.52 George stayed at Rochester until the end of the 1937 season. In 1935 George was still good enough to be one of Rochester's representatives in the combined Bendigo League v VFL match. Playing with other greats such as Bob McCaskill (Sandhurst), Ted Esposito, (Eaglehawk) and Doug Strang (Kyneton). George was again listed as one of Bendigo's best on the day. George retired from the Bendigo League and played for Echuca Imperials in the local Echuca League in 1938. After serving in World War One, George again signed up twenty years later at the start of World War Two. Still playing football, George played in the widely publicised knockout competition in Darwin in 1941.54 This seems to be the last record of George's Footballing days. After the War George became a public figure in Echuca and acted as Mayor and was for many years involved in Council life. George contributed to rebuilding the Echuca Football club after it’s collapse before the war. George served as club President in 1946 and Vice President in 1949 and 1951. He was probably responsible for the Yarraville club's visit to the town in 1948. He also served for a time as Selector and Echuca’s delegate at Bendigo League meetings. In 1946-1947, a new generation also took the field as George's sons started a new story playing with Echuca. George died of a heart attack in 1957, sadly ending a lifelong involvement in football. George was not forgotten by the local football community, with the George Ogilvie Trophy introduced for games between Echuca and Rochester. Later, George was an inaugural selection in the Bendigo Football League Hall of Fame. The Georges and two great football stories. Both worthy as being recognised in the top tier of footballers of their generation.